Are Maltese Beagle Mix Dogs the Right Maltese Mix for You? They are a fairly rare Maltese mix that is hard to find, but makes a great dog. 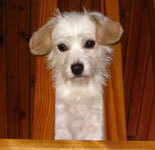 Read more about the Malteagle below to see if this is the right Maltese mix for you. Do you have Maltese Beagle mix dogs? Tell us more about his/her personality & your dog could be famous! These dogs take on the temperanment of both Beagles and Maltese. They are gentle and curious little dogs. Most are very intelligent, but require firm and patient training. They love to follow their noses and are great at tracking scents. It's best to keep this dog active with fun games and exercise to avoid any behavior problems. Maltese Beagle mix dogs do wonderful with children and other dogs, but due to their hunting instincts, it is best not to leave them alone with other small animals. Most people find Maltese Beagle puppies to have a sociable and loving personality. If you already have a Maltese Beagle cross or know someone that does, check out these unique gifts for Maltese mix dog lovers below. Don't see something you like? There are more great Malteagle gifts here. If you like cute floppy ears and a variety of colors, than this Maltese mix might be right for you! Most Malteagles will have the characteristic brown and black Beagle markings, but some are tan or white. Hair is usually short and smooth. Therefore, they need daily combing and brushings. Some Maltese Beagle dogs are non-shedding while others will shed a small amount. Beagles are usually twice as big as Maltese so full grown Maltese Beagle mixes can weigh anywhere from 12-22lbs. Do you have a Malteagle? If so, your Maltese mix could be famous! Please tell us all about your dog and we'll put it on our website. What kind of personality does s(he) have? What makes him/her so special? Let other Maltese Maniacs know what to expect from a Malteagle. Submissions must include at least 200 words of text and a picture to be accepted. Thanks!